Who publishes its pictures in the Internet, knows: Sooner or later they will appear unasked on well-known and less well-known web pages. This is doubly annoying for photographers, bloggers and picture agencies, because not only the theft itself, but also the associated economic damage causes frustration for the authors. 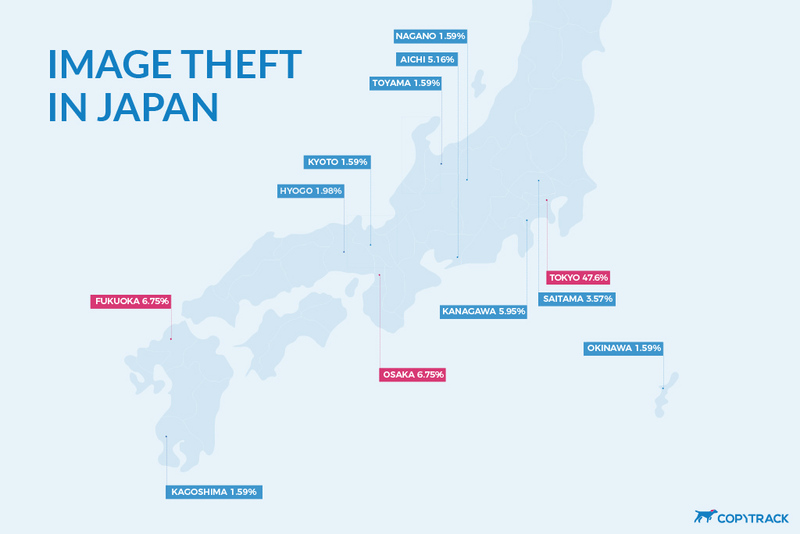 In which Japanese City is Image Theft most Common? Japan is a country of contrasts. It consists of no less than 6,852 islands and, with 126 million inhabitants, is one of the most populous countries on earth. The capital Tokyo and the old imperial city Kyoto boast many historical buildings and wonderful views. Okinawa on the other hand is surrounded by a beautiful emerald green ocean, Hokkaido is famous for its seafood and Osaka stands for good and extraordinary food. With the first photographs by Felice Beato, Japan also became famous in Europe and North America around 1860. To this day it attracts countless photographers and creative people as well as international companies and online traders to Japan. 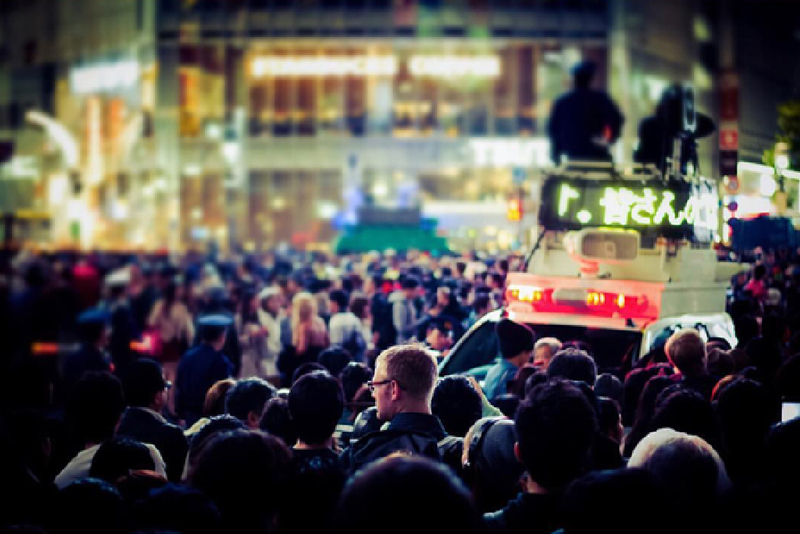 At 47.6%, almost half of all copyright infringements in Japan in the year 2018 can be traced back to the capital Tokyo. Not really surprising, considering that the world’s largest metropolis is home to numerous sights and flourishing tourism as well as countless hotels, international companies and website operators. 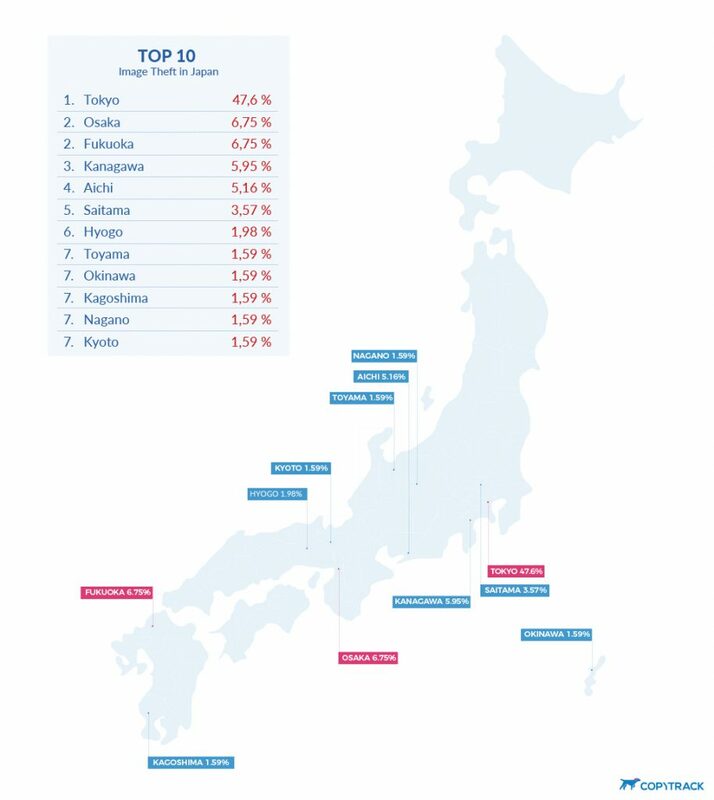 The cities of Osaka and Fukuoka (6.75%) rank second among the cities with the most copyright infringements in Japan. A comparison of the two cities with Tokyo shows that 7 times as many pictures are stolen in Tokyo as in Fukuoka and Osaka. While in Osaka images are used on a variety of international websites, in Fukuoka copyright infringement occurs mainly on regional e-commerce websites. This is not surprising considering that Fukuoka is known for its modern shopping centers like Canal City. 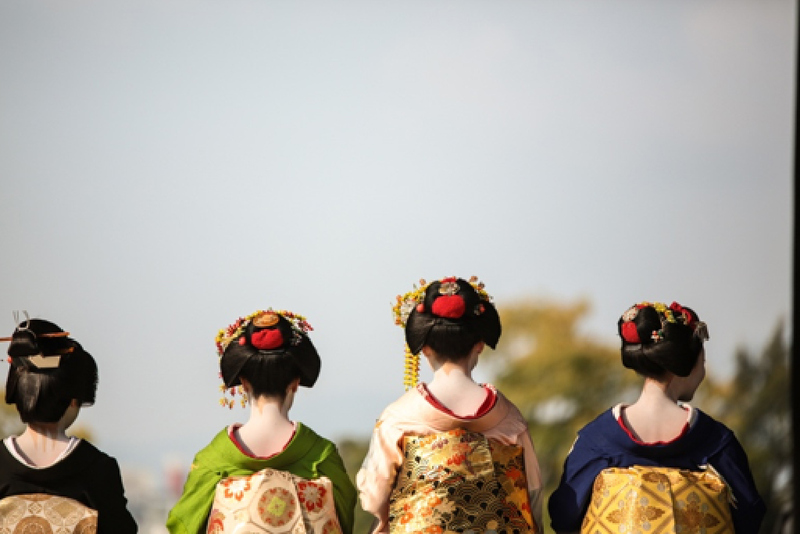 In other large cities such as Kanagawa, Aichi, Saitama, Hyogo, Toyama, Okinawa, Kagoshima, Nagano or Kyoto (places 3 to 10), traditional motifs such as the geisha image are often affected by image theft. In order to illustrate services related to Japanese culture, Kyoto websites also prefer to use images with red leaves in autumn, shrines and temples – but unfortunately here too often without a valid license. Our team has set itself the task of combating infringements of image rights worldwide and strengthening the rights of photographers. This is because around 85% of images uploaded to the Internet are used without the author’s consent. After an analysis of image theft in Germany and image theft in the USA, we have now also taken a close look at copyright infringements in Japan. It is noticeable that more and more pictures are used illegally in the big metropolises. With the respect of the copyright one does not take it apparently so exactly in the big cities – however the Copytrack picture search finds (now or later) all stolen pictures world-wide. And then it can become expensive. Unlawfully used images can quickly result in claims for damages of several hundred to even several thousand euros, depending on the type and useful life of the image.